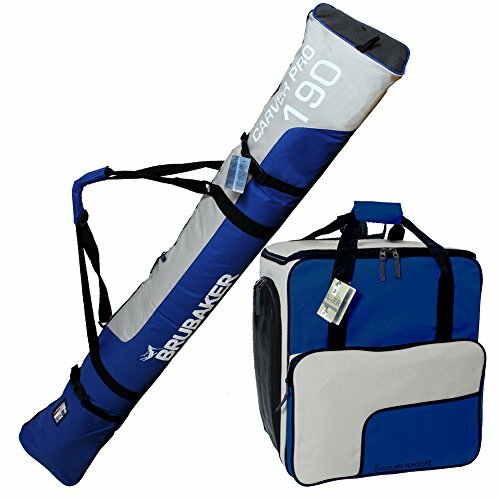 BRUBAKER Superfunction - Combo Ski Boot Bag and Ski Bag for 1 Pair of Ski up to 190 cm (74 3/4''), Poles and Boots - Blue Silver by BRUBAKER at Notakem Bara. MPN: SkiCombo_3430.00_3412.02_BlkGrn_190_se. Hurry! Limited time offer. Offer valid only while supplies last. BRUBAKER Superfunction Combo and Carver Pro holds complete set of Ski or Equipment incl. Boots, Poles, Helmet, Gloves or other bits and bobs. BRUBAKER Superfunction Combo and Carver Pro holds complete set of Ski or Equipment incl. Boots, Poles, Helmet, Gloves or other bits and bobs. for one pair of ski. For all carving, racing and all-mountain skiing equipment. Extremely strong two-way zip. Ventilation eyelet, compression strap with quick release buckle fastening. Long, adjustable shoulder strap with padding in the area of the shoulder. The area around the fittings of the ski is equipped with 10 mm foam padding and cut-resistant fabric (fibreglass film). Outermaterial of the ski bag: Polyester 600D, double PU coated with taped seams. Bag inclusive feet. Address panel. Dimensions: Boot bag 17 1/3" x 16" x 9 1/2"